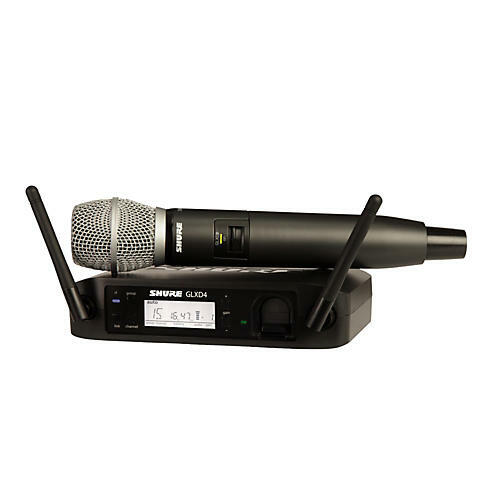 The GLXD24/SM86 system includes the GLXD4 digital wireless receiver and the Shure SM86 cardioid condenser microphone capsule built into a GLXD2 digital wireless transmitter. The Shure SM86 is a unidirectional (cardioid) condenser vocal microphone for professional use in live performance. An extremely rugged microphone, the SM86 withstands the rigors of touring while delivering a clear, studio-quality sound. A cardioid pickup pattern isolates the main sound source while minimizing unwanted background noise. The built-in three-point shock mount minimizes handling noise, and a two-stage pop filter reduces wind and breath "pop" noise. It is housed in the rugged GLXD2 transmitter, and features a tactile on and off switch, and a sophisticated design with durable, lightweight construction. It comes with one SB902 lithium-ion battery. For an experienced vocalist, this microphone presents a world of possibilities. Its proximity effect is not as dramatic as common dynamic microphones, allowing a singer to work mic distance to great effect.It has a strong presence peak for great intelligibilty, and also features rugged construction for reliability. It is housed in the rugged GLXD2 transmitter, and features a tactile on and off switch, and a sophisticated design with durable, lightweight construction. It comes with one SB902 lithium-ion battery. This tabletop digital wireless receiver and has numerous features previously unavailable in this price range including a remotely adjustable gain control for the associated transmitter, one touch frequency selection and real-time battery run-time. Lightweight and durable, it is designed to withstand the rigors of travel and multiple set-ups and tear-downs. Proprietary Automatic Frequency Management - Intelligent frequency management quickly identifies the best open channels.